we noticed a lot ofcomplaints about other brands, where parents have been locked out by theirchildren. Parents have been traumatized and had nightmares, therefor we madethis design specifically for you. Door Lever Lock was designedspecially for parents like you. This door handle lock was designed to fit mosthandles with a really simple installation, your doors can be childproof inseconds just peel & stick, It has strong adhesive this way no child canremove it. When your child grows up and you no longer need these on your doorsjust remove the lock, it’s easy for an adult but hard for a child. 2. Put in on the side of thedoor handle and make sure the door handle in the middle of this items. 4. Press the upper and lowermovable button simultaneously and turn 90 degrees to keep them prependicular tothe door. 1.Upgraded 180° Design – Compared with other 90 degrees door lever locks, Aptoyu childproof lock can rotate 180 degrees by push the upper and lower movable button simultaneously, you can move the handle left or right, to unlock or lock the door lever lock. 3.Easy To Use: Easily for an adult to lock and unlock the lever lock just press the buttons on top and bottom to move the levers, Deter children from opening doors with a Door Lever Lock. 4.Easy Install: No driling needed, very easy to use. Just peel the 3M adhesive and place the lever lock on the right place of the door. Through pressing the button to move the levers of the baby proof door lock in lock and unlocked position. 5.Safe Design: This door locks for kids made of soft PP and TPR, non-toxic, non-polluting and stronger to prevent children from getting hurt. 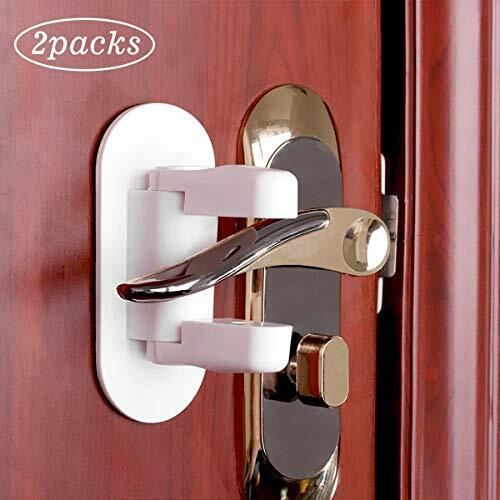 Not just for the doors with handle in bathroom, bedroom, kitchen, toliet, but for the window, cabinets or the tap.